Does Silver Lotto System Really Work? Read Reviews! Silver Lotto System claims it will help you win 9 out of ten times. It uses some form of algorithms that shows patterns to help pick winning numbers. Silver Lotto System Exposed — A Colorful Trap! Sometimes I don’t like this job of digging into different lottery systems. Today was one of those days. Taking a look at Ken Silver’s Silver Lotto System was darn right painful. It’s an over and over again blame on the fact it works for winning lotteries, what Ken has bought himself as a result of winning and testimonials from others who have won. The site is a mess of different fonts, underlining, colors and graphics that pull a persons attention all over the place. Sorting through all the information presented was challenging. Let’s see what Ken says. Ken claims that Silver Lotto System is based on “the evergreen system” and will help you win 9 out of ten times. He says it uses some form of algorithms that show patterns to help pick winning numbers. He does provide several examples though points out not to use these particular patterns and that they won’t work without the support of Silver Lotto System. Ken underlines how much he’s won with some of his purchases including an Austin Martin Vanquish and Bentley Continental GT, two costly cars. The name Ken Silver rang a bell with one of our team members, and after some digging in his files, he came up with another lotto software called Honest Lottery System marketed by the same guy. It seems from reading various articles Honest Lottery System migrated to Silver Lotto System. This lottery system is marketed on a variety of different sites though it seems many of the other have much more talented writers that get to the point faster. 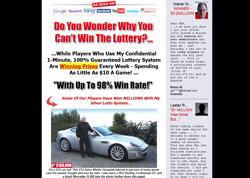 With so many affiliates and people trying to sell what is a questionable software, I was surprised I stumbled on more than one website where people were complaining about what is wrong with Silver Lotto System. Perhaps the most useful one is this Silver Lotto System complaint because both the author and those commenting make some powerful observations. Among the most common complaints is the one that clients don’t receive a refund if they ask for it, despite the claims that the product is guaranteed. It goes without saying that most of those who took their time to post comments recommend people not to trust Silver Lotto System and some are even threatening Ken with legal action. Is Silver Lotto System Worth your Money? I finally figured out how Ken got the money to buy all the things he scatters pictures of all over the website. For the sum of $134, you can be a member and have access to this software. But wait, Silver Lotto System won’t cost you that much, because Ken will make a special discount just for you for $97. I was still sitting there with a silly grin when the next offer popped up. Silver Lotto System can be yours for just today at a discounted price of $39.95 and since it is already midnight, buy it right now. Ya right! I was about to close the website and another promotion hit me. Just for me, just for today and only because I was willing to look elsewhere, I can have Silver Lotto System for only $29.95. Would you mind rating Silver Lotto System? Part of me wanted to sit on the website and see if it would discount even further. It was almost tempting to click okay just to see what happened and then I had a reality check. Why was I going to spend money on software that I already had decided was worthless? Did I really want to fund Ken’s next luxury item? Needless to say, I finally did close the website and won’t be going back there. I particularly liked the part of the article that talked about how the system was discounted over and over. I can’t believe people would buy into this sort of thing. And why give a guarantee that you will not uphold. Guess that’s where Ken makes his money, definitely not on lotteries!